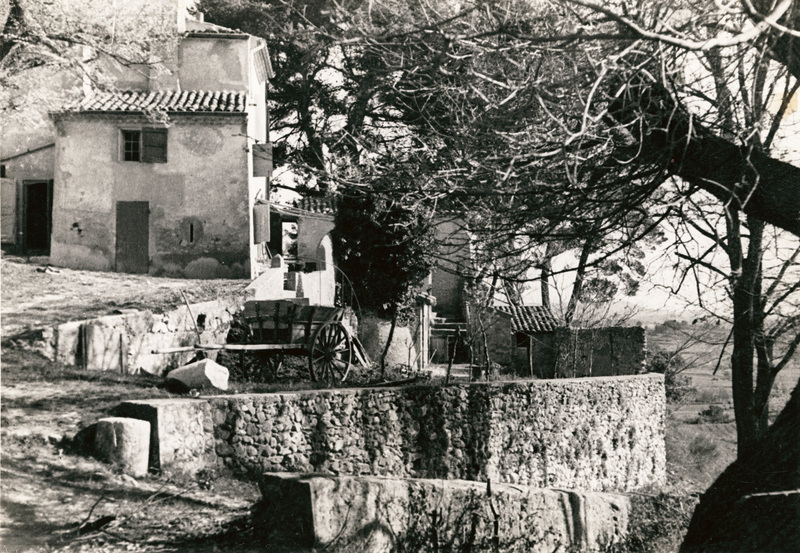 La Maison de Bellevue (the same house, of course, as in R690-FWN268 and R692-FWN270), returns us, however, to the powerful wrenching of space we had seen in Maison et ferme, R600-FWN238. The two photographs show almost no changes over about 100 years, and certainly document that the strong leftward lean is Cézanne’s; as in Maison et ferme, both the buildings and the retaining walls have been rotated counterclockwise. 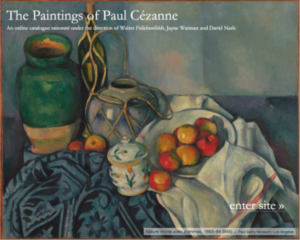 We might wish for Cézanne’s help in understanding this, but he is unhelpful in his few comments on the matter: late in life, pointing to a leaning bottle in one of his watercolors, he corrected it with his thumbnail and said, « I am a primitive; my eye is lazy. I tried to enter the Ecole [des Beaux Arts] twice, but I can’t put things together right. If a head interests me, I’ll make it too big. » The statement is unnecessarily self-deprecating, since in no work based on observation has he made a head too big, and quite misleading, since in no finished landscape could mere laziness sustain the tilt from beginning to end. But there may be something intuitively right about the lazy eye if it is understood to mean one which responds more to dynamic tensions than to the coordinates of geometry. If we are to surmise the purpose of the tilt, we must rely on our perceptual response, as we did with Maison et ferme: the inclination feels tense and uneasy, yet it is relieved by a few balancing elements. 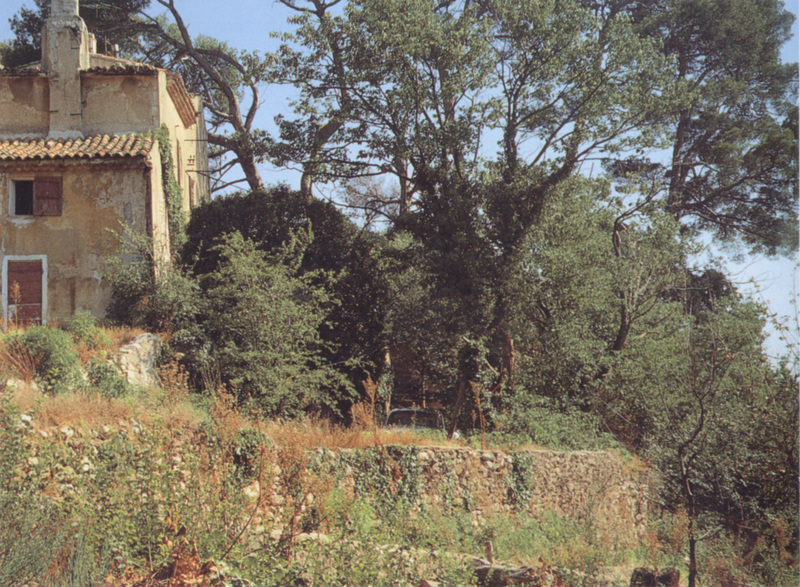 The leftward pull of the buildings seems balanced by the rightward slant of the row of trees and the downward sloping wall; it is as if the canvas were being pulled apart. 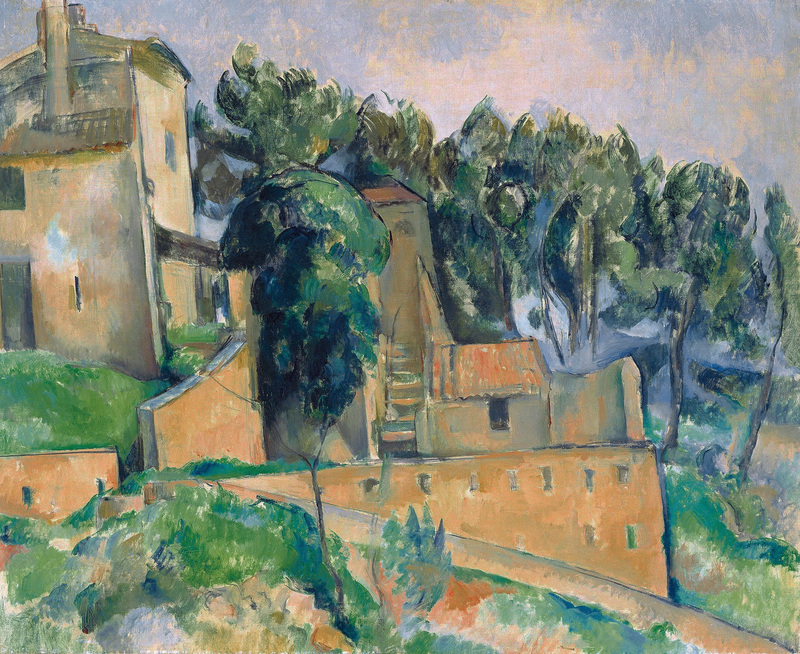 Perhaps to prevent creating a void, Cézanne makes the center more congested than usual; the tree in front is even made to merge with the plane of the building at its left edge. One has the impression that the distribution of centrifugal and centripetal forces « works ». To look at Cézanne’s paintings one cannot follow a formula any more than Cézanne followed one for making them; here the other riveting element is the use of blue next to the Naples yellow group. 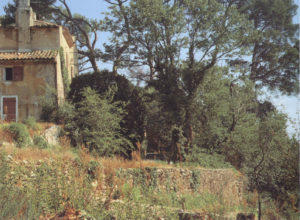 The blue is, of course, a complementary, as cool as the yellow is warm; on the wall of the house on the left, for example, and the top edge of the curving wall leading to the staircase, it provides relief from the torpor of the masonry (the blues were still visible in the site at the time of the color photograph). But the most powerful use of the blue is to create positive space out of negative: where the distant hills can be glimpsed through the trees, Cézanne paints a vague, twisting mass of cobalt blue which fills the space between the trunks with a seemingly thick substance. Besides seeing the picture as a good portrait, we have the greater pleasure of seeing the painting as a configuration of forms and colors in space. Until recently, when it was rebuilt beyond recognition. Reported by Rivière and Schnerb , in « L’Atelier de Cézanne » , in Doran, Conversations, p . 86.